Urban jungle notwithstanding, New York sunsets are gorgeous. And there's nothing quite as wonderful as watching the sunset over a body of water. Take time to enjoy see a sunset in Brooklyn. It's sure to be a highlight of your trip. Go to one of these locations for a photo op, a romantic moment, and to experience an exhilarating moment with Mother Nature right in the middle of the Big Apple. Just to note, a few of these locations offer activities after sundown including film series and great nightlife. Time a walk over the Brooklyn Bridge for sunset. It's spectacular. There are some great spots to take photos on the Brooklyn Bridge. It does get crowded on summer evenings and please be mindful on the cyclists as you take your picture with the backdrop of the sun setting over the bridge. All one can say is thank you, Brooklyn Bridge Park designers, for creating a grassy, breezy, dog-free hilltop facing the Statue of Liberty. It's hard to believe you're in the city here — it's the perfect place from which to watch a magnificent NYC sunset. In the warmer months, on Mondays, the park hosts Movies With a View, a free waterfront film series. You can see the Statue of Liberty from sections of Shore Road Park. It's so airy, you'd never know you were in a city of eight million residents. You can also see views of the stunning Verrazano Bridge. The waterfront Shore Road Park is a true gem. It's also a popular place for runners if you'd like to partake in a pre-sunset run. Perched atop New York Harbor, above Brooklyn Bridge Park, Brooklyn Heights Promenade is a splendid place from which to watch the setting sun. After watching the sunset, walk down Brooklyn Height's main street, Montague Street, filled with restaurants and shops. Or dine at the romantic River Deli restaurant, overlooking a cobblestone street, just blocks from the promenade. It would be hard to beat the views of lower Manhattan, New York Harbor, the Manhattan and Brooklyn Bridges, and the Statue of Liberty that you get at Brooklyn Bridge Park and the nearby ferry landing at the bottom of Fulton Street. Now that you have watched the sunset, it's time to enjoy the area's nightlife. The park behind IKEA or the Louis Valentino, Jr. Park and Pier, sometimes also known as Coffey Park, are so close to the water you can feel the breeze and hear seagulls. Both offer wonderful views for sunset lovers. In the summer, on Tuesdays, after the sun has set, you can stick around for the Red Hook Flicks, a free film series on the pier. It isn't called "Sunset Park" for nothing! This park is one of the highest spots in Brooklyn. Use judgment at night in an NYC park, but in summer when there are lots of families around, it's fun to watch a sunset over New York Harbor from here. 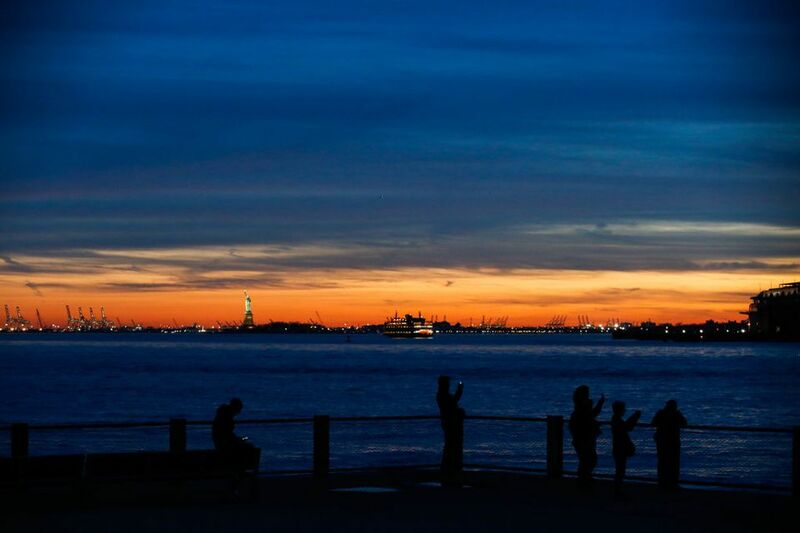 You can see a fantastic sunset in the park or you can head to Industry City and watch the sunset over the water. Leaving the best for last, the most spectacular Brooklyn site from to see the sunset from Brooklyn is aboard a ferry boat. Of course, they run only seasonally. But there are at least two ferries to check out. One is the dedicated IKEA ferry, that runs from lower Manhattan to IKEA in Red Hook. The other is the Watertaxi. Or, head to the Brooklyn Museum on Eastern Parkway for a photo op with Brooklyn's very own huge, authentic, historic Statue of Liberty for a quirky photo of Statue of Liberty replica in the parking lot. Thursday nights the museum stays open until 10 pm, and they usually have a lineup of fun events scheduled.